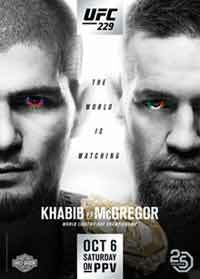 Review by AllTheBestFights.com: 2019-04-13, fight not so exciting between Ovince Saint Preux and Nikita Krylov 2: it gets two stars. Ovince St Preux entered this fight with a pro record of 23-12-0 (78% finishing rate) and he is ranked as the No.17 light heavyweight in the world but he lost two out of his last three fights, against Ilir Latifi (Ovince St Preux vs Ilir Latifi) and Dominick Reyes (Ovince St Preux vs Dominick Reyes); between these two bouts he beat Tyson Pedro (Ovince St Preux vs Tyson Pedro). His opponent, the black belt in karate and Fight Nights Global champ Nikita Krylov, has an official mma record of 24-6-0 (100% finishing rate) and he entered as the No.23 in the same weight class. He fought twice last year defeating Fabio Maldonado (Nikita Krylov vs Fabio Maldonado) and losing to Jan Blachowicz (Jan Blachowicz vs Nikita Krylov). 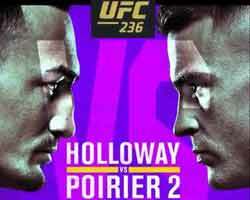 In their first fight ‘OSP’ had beat the Ukrainian via submission (March 15, 2014 – Ovince St Preux vs Nikita Krylov I); this second bout is on the undercard of Max Holloway vs Dustin Poirier 2 – UFC 236. Watch the video and rate this fight! Review by AllTheBestFights.com: 2018-10-06, Ovince St Preux vs Dominick Reyes gets three stars only thanks to a good finish. Ovince Saint Preux entered this fight with a pro mma record of 23-11-0 (78% finishing rate) and he is ranked as the No.13 light heavyweight in the world. OSP has already fought twice in 2018 losing to Ilir Latifi (Ovince St Preux vs Ilir Latifi) and beating Tyson Pedro (Ovince St Preux vs Tyson Pedro). His opponent, the undefeated Dominick Reyes, has a perfect record of 9-0-0 (89% finishing rate) and he entered as the No.30 in the same weight class. In his last three bouts he has won over Joachim Christe, Jeremy Kimballnsen and Jared Cannonier (Dominick Reyes vs Jared Cannonier). St Preux vs Reyes is on the undercard of Khabib Nurmagomedov vs Conor McGregor – UFC 229. Watch the video and rate this fight! Review by AllTheBestFights.com: 2018-06-23, good finsih between Ovince Saint Preux and Tyson Pedro: it get three stars. Ovince Saint Preux entered this fight with a pro mma record of 22-11-0 (77% finishing rate) and he is ranked as the No.15 light heavyweight in the world but he comes off the loss against Ilir Latifi (Ovince St Preux vs Ilir Latifi); before this bout, in 2017, he had beat Corey Anderson (Ovince St Preux vs Corey Anderson). His opponent, the black belt in Japanese jiu-jitsu and kempo Tyson Pedro, has a record of 7-1-0 (100% finishing rate) and he entered as the No.33 in the same weight class. He also faced and lost to Ilir Latifi (in 2017, Ilir Latifi vs Tyson Pedro) but then he came back to win in 2018 with Saparbek Safarov (Tyson Pedro vs Saparbek Safarov). 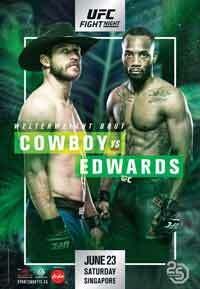 OSP St Preux vs Pedro is on the undercard of Donald Cerrone vs Leon Edwards – UFC Fight Night 132. Watch the video and rate this fight! Review by AllTheBestFights.com: 2018-02-24, great finish between Ovince Saint Preux and Ilir Latifi: it is close to get four stars (UFC Performance of the Night). Ovince St Preux entered this fight with a professional record of 22-10-0 (77% finishing rate) and he is ranked as the No.10 light heavyweight in the world (currently the #1 in this division is Daniel Cormier). OSP suffered three consecutive losses between 2016 and 2017, the last one with Volkan Oezdemir (St Preux vs Oezdemir) but then he has beat Marcos Rogerio de Lima (St Preux vs Rogerio de Lima), Yushin Okami (St Preux vs Okami) and Corey Anderson (Ovince St Preux vs Corey Anderson). His opponent, Ilir Latifi, has a mma record of 13-5-0 (69% finishing rate) and he entered as the No.12 in the same weight class. He lost to Ryan Bader in 2016 (Ryan Bader vs Ilir Latifi) but he came back to win in 2017 with Tyson Pedro (Ilir Latifi vs Tyson Pedro). 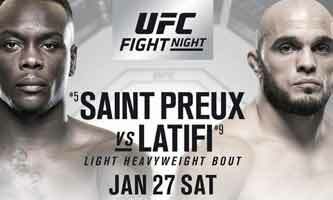 Latifi vs St Preux is on the undercard of Josh Emmett vs Jeremy Stephens – UFC on Fox 28. Watch the video and rate this fight! Review by AllTheBestFights.com: 2017-11-04, spectacular finish between Ovince St Preux and Corey Anderson: it is close to get four stars! Ovince Saint Preux entered this fight with a professional record of 21-10-0 (76% finishing rate) and he is ranked as the No.11 light heavyweight in the world. OSP had suffered three consecutive losses between 2016 and 2017, the last one with Volkan Oezdemir (=St Preux vs Oezdemir) but then he has beat Marcos Rogerio de Lima (=St Preux vs Rogerio de Lima) and Yushin Okami (=St Preux vs Okami). His opponent, the Tuf 19 tournament winner Corey Anderson, has an official mma record of 9-3-0 (44% ko/tko victory rate – he has never won via submission) and he entered as the No.15 in the same weight class but he lost two out of his last three fights: against Mauricio Shogun Rua (=Shogun Rua vs Anderson) and Jimi Manuwa (=Manuwa vs Anderson). Between these two bouts he had beat Sean O’Connell (=Anderson vs O’Connell). 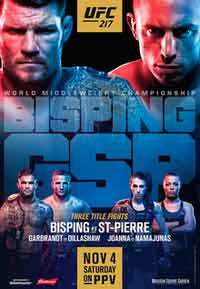 Saint Preux vs Anderson is on the undercard of Michael Bisping vs Georges St Pierre – UFC 217. Watch the video and rate this fight! 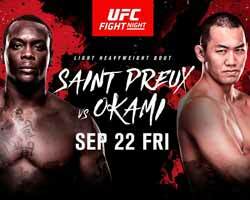 Review by AllTheBestFights.com: 2017-09-23, Ovince St Preux vs Yushin Okami gets three stars only thanks to a good finish (UFC Performance of the Night). Ovince St Preux entered this fight with a professional mma record of 20-10-0 (75% finishing rate) and he is ranked as the No.15 light heavyweight in the world but he won just two out of his last six bouts, the last one against Marcos Rogerio de Lima (=St Preux vs Rogerio de Lima). Before this fight he had lost to Jon Jones (=Jones vs St Preux), Jimi Manuwa (=St Preux vs Manuwa) and Volkan Oezdemir (=St Preux vs Oezdemir). His opponent, the black belt in judo Yushin Okami, has an official record of 34-10-0 (50% finishing rate) and he entered as the No.42 welterweight. He suffered two consecutive losses between 2014 and 2015, against David Branch and Jon Fitch (=Fitch vs Okami), but then he has won four bouts beating Andre Lobato in 2017. Ovince St Preux vs Yushin Okami is the main event of UFC Fight Night 117. Watch the video and rate this fight! Review by AllTheBestFights.com: 2017-04-22, fight not particularly good between Ovince St Preux and Marcos Rogerio de Lima: it gets two stars. Ovince St Preux entered this fight with a mma record of 19-10-0 (74% finishing rate) and he is ranked as the No.18 light heavyweight in the world but ‘OSP’ comes off three consecutive losses, against Jon Jones (=Jones vs St Preux), Jimi Manuwa (=St Preux vs Manuwa) and Volkan Oezdemir (=St Preux vs Oezdemir). His opponent, Marcos Rogerio de Lima, has a mma record of 15-4-1 (93% finishing rate) and he entered as the No.40 in the same weight class. ‘Pezao’ lost to Gadzhimurad Antigulov last year but he came back to win in 2017 against Jeremy Kimball. 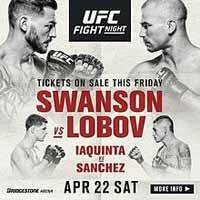 Ovince St Preux vs Marcos Rogerio de Lima is on the undercard of Cub Swanson vs Artem Lobov – UFC Fight Night 108. Watch the video and rate this fight! 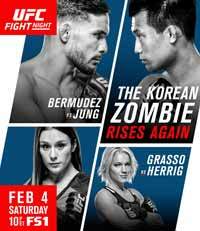 Review by AllTheBestFights.com: 2017-02-04, some good exchanges between Ovince St Preux and Volkan Oezdemir but it is not enough to get three stars, it gets two. Ovince St Preux entered this fight with a professional record of 19-9-0 (74% finishing rate) and he is ranked as the No.14 light heavyweight in the world while his opponent, Volkan Oezdemir, has a mma record of 12-1-0 (83% finishing rate). ‘OSP’ lost three out of his last four fights, the last one against Jimi Manuwa (=St Preux vs Manuwa), while Oezdemir suffered his only defeat when he faced Kelly Anundson in 2014; after this bout he has won over Paco Estevez and Alihan Vahaev. Ovince St Preux vs Volkan Oezdemir is on the undercard of Dennis Bermudez vs Chan Sung Jung – UFC Fight Night 104. Watch the video and rate this fight! Review by AllTheBestFights.com: 2016-10-08, good finish between Jimi Manuwa and Ovince Saint Preux: it gets three stars (UFC Performance of the Night). Ovince St Preux entered this fight with a record of 19-8-0 (74% finishing rate) and he is ranked as the No.12 light heavyweight in the world while his opponent, Jimi Manuwa, has an official mma record of 15-2-0 (93% finishing rate) and he entered as the No.14 in the same weight class. Both fighters have lost two out of their last three fights: ‘OSP’ was defeated by Glover Teixeira (=Teixeira vs St Preux) and Jon Jones (=Jones vs St Preux) while Manuwa lost to Alexander Gustafsson (=Gustafsson vs Manuwa) and Anthony Johnson (=Johnson vs Manuwa). 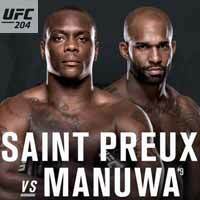 Saint Preux vs Manuwa is on the undercard of Michael Bisping vs Dan Henderson 2 – UFC 204. Watch the video and rate this fight! Review by AllTheBestFights.com: 2016-04-23, fight not particularly good between Jon Jones and Ovince Saint Preux: it gets two stars. The black belt in gaidojutsu and former Ufc light-Hw champion Jon Jones entered this fight with a professional record of 21-1-0 (71% finishing rate) but he is not ranked as he hasn’t fought since January 3, 2015 when he defeated the current #1 Ufc champion Daniel Cormier (=Jones vs Cormier). After this bout, Jones was stripped of the belt and suspended from the UFC in connection with a hit-and-run incident that he was involved in. Jon ‘Bones’ Jones was originally scheduled to face Cormier, but Daniel injured his foot three weeks before the fight. His opponent, Ovince St Preux, has an official record of 19-7-0 (74% finishing rate) and he entered as the No.13 light heavyweight in the world. ‘OSP’ lost to Glover Teixeira last year (=Teixeira vs St Preux) but he came back to win in 2016 defeating Rafael ‘Feijao’ Cavalcante (=Saint Preux vs Feijao Cavalcante). 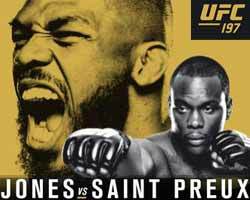 Jones vs St Preux, main event of the Ufc 197, is valid for the interim Ufc light heavyweight title. Watch the video and rate this fight!